One of the finest examples of Rajput architecture and also one of the greatest citadels in India, Chittaurgarh Fort is located in the southern part of the state of Rajasthan, India. Lying on the bank of the river Gambheri, this magnificent fort stands on a 152 m high rocky hill rising above the surrounding place. The fort has seen the bloodiest battles besides three great sacks during its long history. Embellished with a number of richly decorated buildings, the fort sprawls over 700 acres, extending to 3 kms in length and 13 kms in peripheral length. Even though, most of the places inside the fort are in virtually deserted ruin, the views from the walls, on all four sides of the fort are marvelous.Said to be built by Chitrangad of the Mori dynasty in 7th century AD the fort was dominated by Gehlot rulers for few period but most part of the history the fort was dominated by the Sisodia kings. But according to legends, the fort's original construction goes to Bhim (one of the Pandava heroes of the epic Mahabharata). Named after Chittrangad Mauraya, the fort has witnessed three battles and 'Jauhars' (a custom of mass suicide in medieval times by Rajput women in which they commit suicide in the fire to save their honor from the hands of the enemy). The entrance is through a zigzag pathway interrupted at intervals by seven huge gateways or pols. They are, the Padal Pol where Rawat Bagh Sigh, the Rajput leader, fell during the second attack, the Bhairon or Tuta Pol where Jaimal, one of the heroes of the third attack was killed by Akbar in 1567, the Hanuman Pol and Ganesh Pol, the Jorla Pol whose upper arch is connected to the Lakshman Pol, finally the Ram Pol the main gate which was built in AD 1459. The Hanuman Pol, the Ram Pol, and the Lakshman Pol have a temple in their vicinity. The Jorla Pol has two adjacent gateways. These all are guarded by iron spiked door served as a watch tower in earlier times. Inside the walls is a village and ruined palaces, towers and temples. 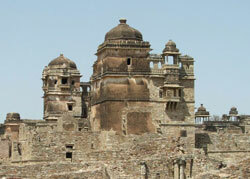 It is the massive and biggest monument inside this Chittaurgarh fort. Lies on the right immediately inside the fort it was originally built of dressed stone with a stucco covering. The palace gets its name after Maharana Kumbha (AD 1433-68) who undertook extensive repairs to the old edifices. The palace is approached by two gateways known as Badi Pol and Tripolia Pol leading further to Suraj Gokhra, Zanana Mahal, Kanwarpada-ka-Mahal in the open courtyard. The palace contains elephant and horse stables and a Shiva temple. The famous Jauhar lead by Queen Pamini and her women is said to have taken place in one of the underground cellars. The palaces of Pannadhai and Meerabai are situated in the southern part of this palace complex. Across from the palace is the archeological office and museum, and the treasury building or Nau Lakha Bhandar. The Singa Chowri Temple is nearby. Situated just beyond the Rana Kumbha Palace, it is an early 20th century palace built by Maharaja Fateh Singh (AD 1884-1930). The palace houses exquisite chandeliers and rare paintings, unique crystal and crockery collections. This double storeyed modern building also houses a museum. Established in 1968, it contains a large collection of sculptures dating back to the 3rd century BC, weapons and armory of the rulers, wooden crafts of the tribals etc. The museum is open daily, except Friday, from 10 am to 4 pm. Entry is Rs. 2/-. Lies along the shores of Lake Pichola, this is now converted into a hotel, but still operated by the reigning Maharaja. The hotel has been awarded the National Tourism Award for the best heritage hotel in 'Heritage Grand' category by the Tourism Department of India. One of the most interesting buildings in the fort, built by Maharana Kumbha in AD 1448 to commemorate his victory over Mahmud Khilji of Malwa in 1440. Generally known as Vijaya-Stambha, it is Dedicated to Lord Vishnu, the tower stands on a base of 14 m square and 3 m high, and rises 37 m in nine storeys. One can climb up to the top storey through narrow stairs. An inscription in the uppermost storey giving detailed chronological account of life and achievements of rulers of Chittaur. The names of Sutradhar Jaita ( the architect of this tower) along with his three sons Napa, Puja and Poma are also inscribed in the fifth storey. There are carvings of sculptures from the Hindu mythology. Entry is Rs.1/-. Free on Friday. 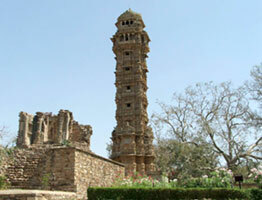 This is another famous tower at Chittaurgarh Fort and also the most interesting Jain monuments of the age. The exact date of building is not known but seems to have been built in the 12th century. It is dedicated to Adinatha (the first Jaina Tirthankara). This tower was built by a Jain Merchant, Shresthi Jija in AD 1300. The tower which has seven stories on the basement is 24.50 m high, 30 feet wide at the base and 15 ft. wide at the top. Naked images of Tirthankaras are repeated several times on the face of the tower. In each niche of four faces at the 2nd story, the image of Adinatha is enshrined whereas upper storeys contain hundreds of miniature images of Jain divinities. A close staircase is built inside to reach the top seventh storey. Named after Rani Padmini (the beautiful wife of Rana Ratan Singh), this four storeyed palace was built late 13th century, and was rebuilt at the end of the 19the century. It lies at the northern side of a large pond called Padmini pond. Legend relates that Ala-ud-din Khilji, the King of Delhi, was allowed to see the reflection of Queen Padmini in this palace through a mirror and subsequently attacked the fort. The bronze gates in this pavilion were carried off by Akbar and now it is in Agra Fort. A three storeyed pavilion known as Jal Mahal stands in the middle of the pond. 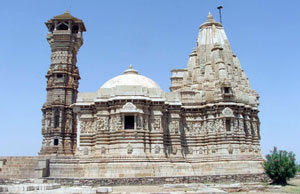 Dedicated to Lord Siva, the temple was built by Bhoja Parmara in early 11th century AD and renovated in 15th century. Thrimoorthi Shiva (three faced Shiva) is enshrined in the sanctum and the temple consists good sculptured friezes. Garbhagriha, an Antarala and a Gudha-mandapa with Mukhmandapa (entrance porch) on northern, western and southern sides. It is situated in the south of Samadhisvara temple and there are steps from this temple going down to this sacred water reservoir. It is a deep, rock-cut tank with an irregular oblong shape. It is called this because of the water flows into it from a small natural cave through a 'Gaumukha' (Cow’s head shaped out let). The view from here is marvelous. The opening here leads to the cave in which Rani Padmini and her maidens are said to have committed jauhar. It is situated near the Padmini Place. 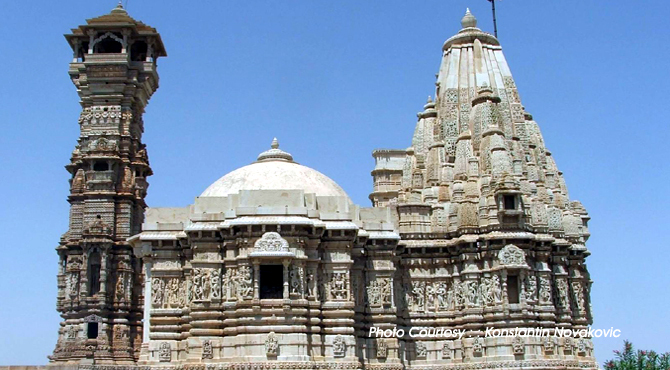 It was originally an 8th century Surya temple, now dedicated to Kalika Mata or goddess Kali. Built by Raja Manbhanga, the temple has undergone several renovations. The temple has a Garbhagriha, Antarala, a closed mandapa and a Porch. Daily worship takes place here. Also known as Hinghlu Ahada's Palace, it is located along the Ratneshwar Lake. Built in stone around, the palace had stucco covering. This palace is credited to Rana Ratan Singh II (AD 1528-31). Originally a rectangular in plan and enclosed within a high wall, it was subsequently comprises a courtyard surrounded by rooms and a pavilion with balcony on the eastern part of the second storey. Built in 8th century AD, this temple was originally dedicated to Varaha (boar incarnation of Vishnu). Renovated by Maharana Kumbha (AD 1433-68) the temple is built on a raised plinth and consists of a garbhagriha (the inner most sanctum) , an antarala (a small antichamber), a mandapa (pavilion), an ardha-mandapa (half pavilion) and an open pradakshinapath (passageway). An image of Varaha is shown in the principal niche on the back of the shrine. In front of the temple is an image of Garuda under a canopy. It is a small temple stands on the north of the Kumbha Shyam temple. Legends that Meerabai (devotee of Krishna) had worshipped Krishna at this temple. The original idol in the temple is taken to the Udaipur museum, and a new idol is placed inside the sanctum. A picture of Lord Krishna and Meera, has been placed inside this temple. It is a 11th century Jain temple with 23 Jain shrines. Built in AD 1448, the main shrine consists of garbhagriha, antarala, mandapa, sabhamandapa and mukhamandapa. To the east of the complex, there are two shrines facing east.